Aiden was once mated and bonded to a royal vampire, Larissa. That was 60 years ago. However, their mating was short lived when Larissa disappeared and their bond was broken. Which led Aiden to believe that Larissa was dead, since that’s the only way a bond can break. So he’s spent the last 60 years mourning the loss of his mate. A mate that no one else knew he had, until he sees her while on a mission with his packmates. That’s when all hell breaks loose. We meet Aiden earlier on in the series. He’s a flirt but we realize in this book that it’s his way of sticking it to the stupid males who play games instead of just claiming their mates. He doesn’t get why people take what they have for granted when he’d give anything to get back his bondmate. So when he sees her at the club, he goes a little nuts. At first he thinks his mind is playing tricks on him, but then he realizes it’s Larissa and he’s elated. That is, until he scents the fear and confusion rolling off of her when she looks at him. Larissa has been in stasis for 60 years. She has no memory of Aiden, but was told by the witch who brought her out of stasis that this Aiden was obsessed with Larissa and killed her parents after they had her put in stasis to protect her from him. So when Aiden acts possessive, protective, and pretty much just acting down right familiar with her, she’s thrown through a loop. Especially since her body is reacting to him and doesn’t feel threatened by him. She soon realizes that the witch lied to her, but no one is sure why or what happened to Larissa and their bond in the first place. I love this series. You want to know why? It’s because you read the synopsis and you see two leading characters. However, the book is so much more than that. You get multiple character stories in one. For instance in this one we see three separate relationships bloom. One from start to finish, another that’s just starting, and the last has yet to mature to that point. Not one chapter goes by where we are reading from the same two POV’s. Nope, we get POV’s from a bunch of characters, including the villains. Which let me just say that I don’t even know how to feel about that one. The witch… the witch I just felt sorry for. But it’s those feelings you feel when reading this series that makes it so great. Katie Reus brings her characters and their world to life. She makes you care for them. She shows you the bad and good in the villains. Not one character is one dimensional. Not one story so far has been lacking. She doesn’t just give you one pair of main characters per book, she gives you a whole pack of characters per book. I’m not normally a series fan. I tend to get bored with them after a few books of the same thing over and over again but with new characters. Katie Reus brings new characters, new situations, new battles, new everything to the table with every book. Not once have I felt like I’d read this before with her. Every time she shines the spotlight on other characters in the book I get excited. Not only does it switch up the story some, but it’s like getting multiple stories in one. However, we only follow the main characters HEA to the end. 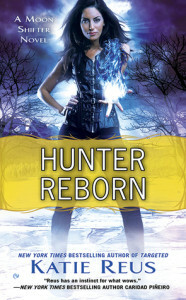 Seriously, if you are looking for a paranormal romance book, then pick up this series. You won’t be disappointed. There’s romance, violent battles, steamy scenes, suspense, and an array of characters that you will fall in love with. If that’s not convincing then let me just say this… I don’t buy physical books because I don’t really have the space for them. Most of the books I get for review turn around and go out as giveaways. However, I have every book from this series sitting on my bookshelf. That’s how much I love it. Funny you say that because this is the only series I’ve read from her and I love it. I have her contemporary suspense on my shelf but I haven’t had a chance to read it yet. I love memory loss type books. I am so interested to see why these two were separated.